I'll be the first to admit it, I don't really get excited about superhero movies, whether they are from DC, Marvel or anyone else. I have enjoyed some of those that I have seen, and I think that Christopher Nolan's realization of Batman is fantastic, but for the most part I just wait until they hit dvd (I think Spiderman 2 was the one and only that I caught at the theatre). When I first saw the trailer for Iron Man though I knew it was a movie that I needed to see, and good lord for some reason I took my sweet time about getting to see it. The reason for wanting to see it so badly though was not for the character of Iron Man, no, it was because Robert Downey Jr. was in the lead role. Personally I think he is an underrated actor and from what I saw of the movie in the trailer I was convinced I wouldn't be disappointed. Thankfully I wasn't wrong. 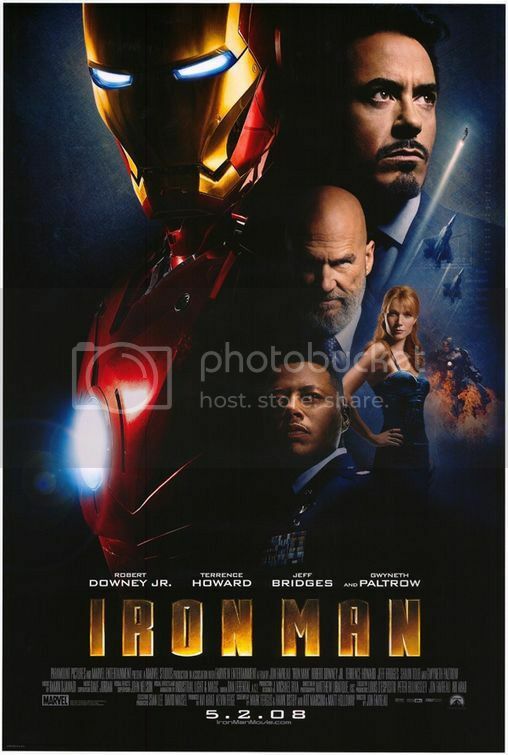 The movie itself is about egocentric billionaire weapons tycoon Tony Stark (Robert Downey Jr.), who upon a visit to Afghanistan to showcase some new, and quite spectacular, weaponary ends up getting kidnapped by a group of war-hungry militants. Their demands are for him to build them some of his new weaponary, his answer is to build himself a new highly armoured and heavily weaponed suit. And as Black Sabbath once sang " I am Iron Man". Obviously there is far more to the story than which I have just outlined, such as Stark's business partner (an awesome Jeff Bridges), his longstanding personal assistant Pepper Potts (a gorgeous Gwyneth Paltrow) and his good friend (Terrence Howard), but again, to tell too much would be pointless if you plan on catching the movie. As you might expect from a movie such as this there are special effects galore, something that director Jon Favreau handled superbly as well as the direction in general as he really did surprise me. There is quite blatantly a shitload of CGI on display here, none of it though seemed anything other than seamless though, in fact the majority of the movie is more about Stark and his conflicts rather than high octane superhero sheneigans, of which there is plenty by the way. For me though, what held this movie together, and lifted it way above so many other big budget movies of this ilk, was Robert Downey Jr.'s central performance. To be quite honest he was fantastic in the lead role; his delivery of his dialogue was nigh on perfection. A rich mix of dead-pan humour and over the top dramatics throughout, I really couldn't picture anyone else playing this character after seeing him in the role. Mind you, this would probably not have worked as well had it not been for his solid and pitch perfect supporting cast. Brideges, Howard and Paltrow all deliver the goods in their roles; maybe Paltrow's as Pepper Potts could have been developed slightly more but still she carried it off so well. Iron Man was a quite fantastic blend of action, humour and quality acting, and quite frankly I cannot wait until a sequel rears its inevitable head. Glad you liked it. Very good review. By far my favorite film of the summer.